KHS MISSIONTIMER 3 - Designed for the toughest use and precision. The KHS Missiontimer 3 was developed as an "employment clock" which shows precisely the time even under the harshest operating conditions. 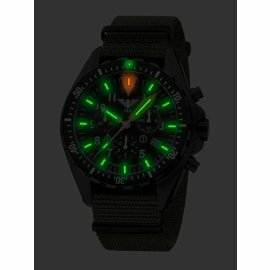 This very robust military watch is equipped with H3 gas lamps Trigalights® and therefore very well readable even in the worst light conditions and absolute darkness. The Missiontimer 3 is the perfect timepiece for any application.